6 days of outdoor activities to explore the Verdon... inside out ! * Rafting: day trip (inflatable and stable craft where the crew paddles as instructed by the guide). * Cano-raft: half-day (inflatable 2-men canoe where the team paddles autonomously). * Hydrospeed: half-day (swimming down a river with the help of flippers and a floating board). * Air-boat: half-day trip. (inflatable one-man kayak where one paddles solo). * Moutain bike: day trip. Take a ride to explore the surroundings. 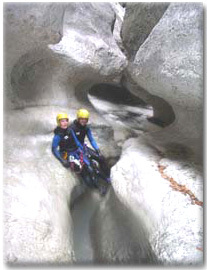 * Canyoning: half-day (descent of a canyon - in this case, one of the tributaries of the Verdon River). 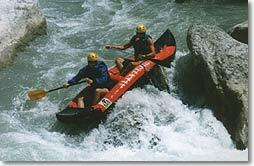 Monday: Meet at 9:30 am in Castellane for a rafting day trip. Our guides welcome you, hand out the equipment and give their crew a safety talk. You are now ready to embark on a rafting day trip that is about to take you from Castellane to the Samson Corridor (4 hours and 22 km of navigation). 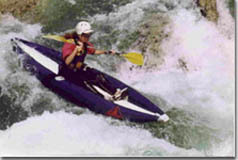 The first section is relatively easy; there is plenty of time to become acquainted with the rafting techniques. On this first part of the river, class II rapids are mostly encountered. The morning ride ends with the negociating of the "Barre St. Jean", a rapid graded III (medium difficulty) requiring more manoeuvering than the previous ones. Soon after this exciting moment, it is time to stop for lunch on the river bank or at a nearby restaurant. Following the midday break, your descent continues towards the Verdon Gorges. Right at the entrance of the Gorges, a fun rapid (class III) called "La Dégoulinante" is waiting for you for a real roller-coaster ride on the waves. From that point, we take some time to marvel at the work of millions of years of erosion on the impressive limestone cliffs surrounding you between the successive class II and III rapids. But the excitement is not yet over, as the right-angle shaped, class IV "Solitaire" rapid - the steepest and the fastest rapid of the descent - is soon coming up. This exhilarating rapid marks the end of the trip. There is a 10 mn walk out of the Gorge to reach the Samson Corridor Belvedere, where our bus is waiting to drive you back to Castellane. Tuesday: Meet at 9:30 pm in Castellane; the guides are there to welcome you. They hand out your equipment and give a safety talk. You are now ready to embark on a cano-raft descent of the Verdon that will take you from the Castellane to Chasteuil beach (8 km and 1h30 of navigation). The difficulty level on this trip is progressive, with an easy first section and a more challenging one at the end. 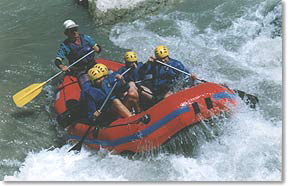 In the first part, you ride mostly small rapids (class II), which gives you time to become fully acquainted with the boat and learn to manoeuver it smoothly.Towards the end of the descent, you hit the exciting "Barre St. Jean" class III rapid (medium difficulty), which is the final one of this descent. Depending on the route you choose, this rapid can be more or less challenging. But it is definitely the place to apply what you have learnt during the trip. In any case, it is the highlight of your descent and a lot of fun. When every team has run the rapid, you then carry on to our private ground "La Pinède", where the trip ends. After getting changed, you are driven back to Castellane in the company bus. Wednesday: Meet at 9:30 am for a half-day air-boat descent. The guides hand out the equipment and give a safety talk. Then, you are ready to set off for a descent of the Verdon of 8 km which takes 1h30. Sitting on a inflatable kayak called "air-boat", You paddle solo, still with a guide coming along. The first section is easy, it gives you time to practice this particular type of boat. Then, small rapids (class II) come up before you get to the rapid of the Barre St. Jean (class III rapids : medium difficulty). We stop to discuss our run and then, it is your turn to go for it! A thrilling rapid when you ride by yourselves ! After getting changed, you are driven back to Castellane in the company bus. Thursday: Meet at 2:00 pm for a half-day white water swimming descent. The guides hand out the equipment and give a safety talk. Then, you are ready to set off for a descent on the Verdon of 4 km which takes 1h30. Helped with a specially designed floating board called "hydrospeed", we use flippers to make our way down the river as indicated by the guide. The first section is easy, it gives you time to practice this particular type of swimming. Then, small rapids (class II) come up before you penetrate inside the entrance of the Verdon Gorges. After a series of class III rapids (medium difficulty), you run the final class IV rapid (medium/high difficulty), which brings you to the Samson Corridor. All that is left to do is to walk up to the Samson Corridor Belvedere with your equipment for about 10 mn - our bus is there waiting for you and you are driven back to Castellane. Meet at 9:30 at our rope course "Adventure Forest", 5 mn away from Castellane . Move from tree to tree on a series of varied challenges at a height of 2 to 12 meters above ground. Test your balance on Nepalese bridges, slide on death slides, thread your way through hanging barrels - all of this in complete safety. All you need to do is to put on a harness, follow a few simple safety instructions, and all the fun and excitement will be yours! A total of 50 varied and progressive challenges await you in the forest. This real forest adventure is performed in an exceptionnally beautiful 3 ha. site planted with pine trees and broadleaved-trees, and is bordered with cliffs overlooking the Verdon river. Saturday: Meet at 10:00 am at "Les Chasseurs" restaurant (village of La Batie, 10 km. from Castellane on the N. 85 road to Nice) for a real incursion inside one of the tributaries of the Verdon River : the Jabron Canyon. The canyoning guides will welcome you there. They will hand out your equipment and give a safety talk. A short walk will take you right up to the entrance of the canyon. Then, you will be introduced to the abseiling techniques and slowly penetrate inside the canyon. Soon, you will need to adapt your progression technique : you will abseil down a 5 m "rappel", slide down a natural stone slide, and jump in clear pools at the heart of the canyon. At this end of the descent, a short walk will take you back to the start. 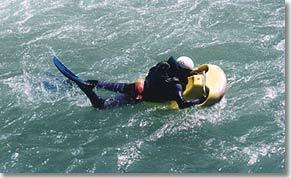 * Insurance (civil liability for ABOARD Rafting). *Being able to swim is essential. * Minimum age: 14 years old. * Period of validity: from 2 April to 17 June 2007. * No previous white water experience is needed! * Things to bring: swimming costume, sports shoes, towel, string for glasses. Price per person: 210 Euros. For any information concerning booking and cancelation procedures or insurance details, please refer to the "General Terms and Conditions" section, where you will find a Booking Form. The Verdon water levels are regulated by the national Electricity Company. This implies that, in case of low water level due to insufficient dam release, we may perform our white water activities (cano-raft and rafting) on the Upper-Verdon. The canyoning activity relies on favorable weather conditions. In the event of heavy rainfall, the canyon may be flooded rapidly. For this reason, in case of high risks of rain, the guides reserve the right to postpone the outing. A choice of accomodation is offered in Castellane, at campsites, guest houses or hotels. If you are interested, please contact these places directly to make your bookings arrangements.